I like almost everything about PlanGrid. Almost. Would be great to be able to leave/delete projects more than one at a time. How about a select and leave/delete multiple projects feature? It would be nice if you could slide the heading/tab margins over so you could read the entire title or heading. I just downloaded the app because I just needed a .dwg viewer but I was not able to with this app. Anyways the app is good. For the most part it works well, but for the fact that you have to recreate it daily. This is time consuming and a waste of time for the personnel doing this. This has made me stay with the current system we use. The report is usually done by the field personnel on a daily basis and needs to have the ability to copy over and save all the information from the previous day and then edit the date and information and save it for the current day’s report. This would include all vendor and manpower reports as well as notes ,equipment, and issues. $50/month for the cheapest service. I pay less for my monthly cell phone service. Does PlanGrid really believe their app is more valuable than a cellphone? 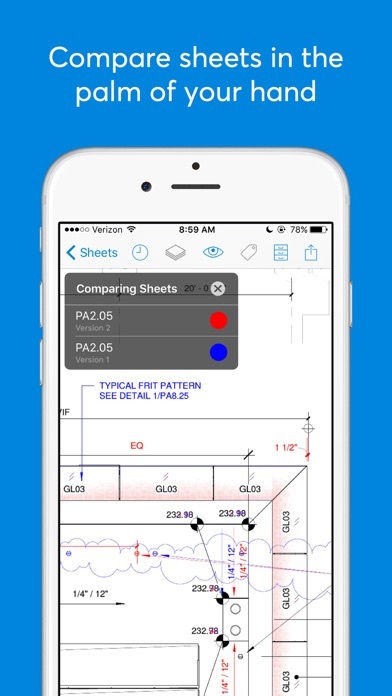 I being using PlanGrid since 2013, they have updated and change for good. I feel they still have room for improvement as I always look for a continue improving excellence. This application is fast and helped me move from revisions and redlines needed to make changes transparent and save time and lots of money. I would like to have them improve on the revision part. I feel they need to adopt same tools adobe has. Rotate text and more drawing tools. Probably include the same tools they have on sheets to be able to use them for documents. I am a small subcontractor that uses very few pages from plans. I have 4 employees. Sometimes, I work large projects that upload 550+ pages. In order to use the app at all after the trial period, I am being asked to pay $59.99/MONTH. Hard pass. The app is nice, but not that nice. I’d rather just view the plans in iBook. This used to be a great app for the occasional punchlist. It was free and very useful. They have however started charging a $40/ mo fee which does not make it an option anymore for the occasional user. Preferred old view when looking at docs in Document folder. Unable to see full name of document. The number 1 requirement for any construction / plans management software is ease of use. It doesn’t get any easier than PlanGrid. I have non-tech savvy superintendents using it with no problems or kick back. 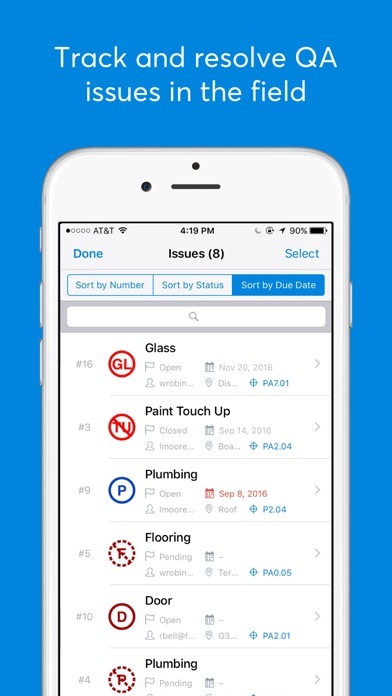 We really enjoyed using PlanGrid for the time that it was free, but once it became a subscription only app ($39-$119/month depending on number of users), it was no longer financially feasible or compatible for our small firm (2-5 staff). Program renames pictures and extraction is lacking. I’m going to start off with Brittany, she is very professional, everyone on the customer service side seems to care. I have paid for this program for over two years, and over the last two months the program has not worked properly, when attempting to extract pictures in the order they were taken, offline. I informed Plan Grid of this issue in June, and as of the 1st of August this is still not working. Customer service has done their best to help, but it is still not working. When I pay for a program I expect it work. For a program that requires subscription like Plan Grid, the company should be willing to prorate the subscription, when the program is not functioning. I won’t be returning which is disappointing. “As of April 23rd, we expired our free Hammer plan to focus all of our development and support efforts on the needs of our paying customers. This allows us to continue growing and innovating as the most effective and efficient construction productivity platform. You would need to upgrade your license to continue using PlanGrid.” The fact that you no longer offer the free version of your service is awful. It’s too bad, because I really enjoyed the functionality of PlanGrid. I am running a very small business, and I cannot afford a $49.99 per month charge. I do not need more than 50 sheets per month because I don’t get that many projects. Therefore, I have deleted the app and I am currently in search of another app developer that can provide me with the product I need. I think it is a terrible and greedy decision to take away the free (under 50 sheets) service from your app. I think you should have still offered the free service and charged maybe a one-time fee if my only intention was to use the free service. It’s too bad. Another great American business turned to corporate greed in attempt to secure as much as it can of the all-mighty dollar from every hard working citizen. This move may help you companies profits increase, but you integrity level has decreased in my opinion. With a few tweaks it would be perfect but don’t wait for perfection, it is great how it is. Here are my recommendations: 1. Bring back a limited plan that can be used for Collaborators only, people who need access to the information but who cannot interact or push markups to the master set. 2. 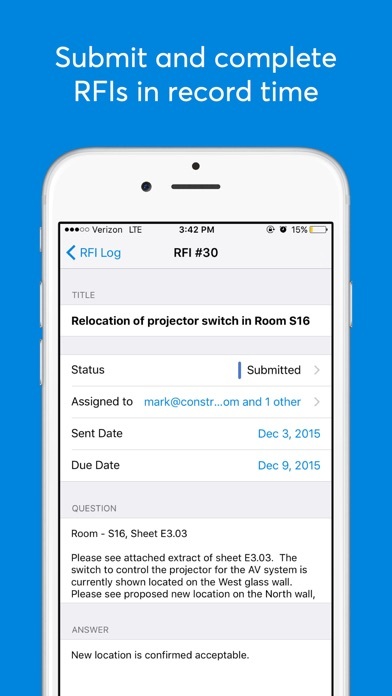 Allow full administrative privileges from the app. There are many times when I am not near my laptop but I need to add a sheet or to perform some other function. The browser support on the iPad used to work but it no longer does and I cannot administer through the app. 3. Allow for templates to be used for creating projects. We don’t use the default issues list and have a standard folder structure for the documents. We have to create these each time we open a new project. 4. Allow for a forced review of comments that are added to in the settings tab. The way things are currently, comments are made but do not need to be acknowledged... working in construction, I promise you nobody looks for them:-) I would like the option to post comments that have to be acknowledged before proceeding... with this feature I would have confidence to use the comments as a tool. 5. Allow for issues reports to be customized so that only certain colors or issue types can be sent. Filtering issues doesn’t stop all of the issues from being sent. There are times, many times... most of the times that I don’t want all the issues to be sent with the issues report. The same would be good for the other reports. I would like to be able to send only certain color markups or markup types. 6. Allow for batch editing of jobs for example: removing from account, setting them to be managed by a different organization or adding or removing users. Right now these only can be don one job at a time... if an employee leaves or is terminated, we have to remove them from each job individually and this is very tedious. 7. When taking pictures with the feature allowing annotations, there is a problem that makes the program run slow when too much writing is added to the picture... it gets bogged down. Also, add an undo button to this feature so that a mistake does not require a fresh start. We couldn’t run our business without this tool. Absolutely essential to our organization. Fast, intuitive but has limitations with collaboration with subs unless they purchase a full license. My architect sent me plans for my house that I built 3 years ago. I would occasional show plans to my friends and praise plan-grid. I don’t really use it, just show people plans of the house already built. Recently plan grid has a bright idea:let’s charge everybody 49.99 a month !! Makes sense to charge popper for an active construction project, makes no sense for people who just want to keep a few pages for historical reasons. I will be uninstall my plan grid. Great app; 5 star team! What’s up with the pinch and zoom? This changed in a recent update and has become a major annoyance. Previously you could pan and zoom in and out simultaneously. Now if you try and pan while zooming it changes sheets. Not sure the reasoning, but slows down usage and speed of review. Document uploads are also a random issue, but I think that’s resolvable. This is a total piece of crap. Unless you pay 40-120 a month. This is not what I though it would be and It is a total waist of money. Downloaded the app and can’t do anything with it. Trying to update the app to see if that will help and the update is not even working. Trying to cancel less than an hour after purchasing and now that seems impossible too! PlanGrid is a great application and is very simple and easy to use. The only negative aspect of the app is when your zoomed into a page, accidentally using two fingers to pan switches the page. Very frustrating! PlanGrid should provide a fix and think that they will. I find the use of this in the projects we do to be essential after the free trail period. We are a mechanical company traveling in several directions remodeling major retailers, so imagine all the blueprints I would have to carry. Maintaining the paper work is a breeze with several ways to implement. The instantaneous communication is one of the best thins about this. Documentation is simple with this cloud based system. The only problems I encountered were user error. The support staff at PlanGrid is really committed to helping me in any way possible. Took the time to make sure I knew how to successfully succeed at using this tool. Very Pleasant experience. If thinking about how to speed up the production and planning of a project, I highly recommend this application system. Good job guys. 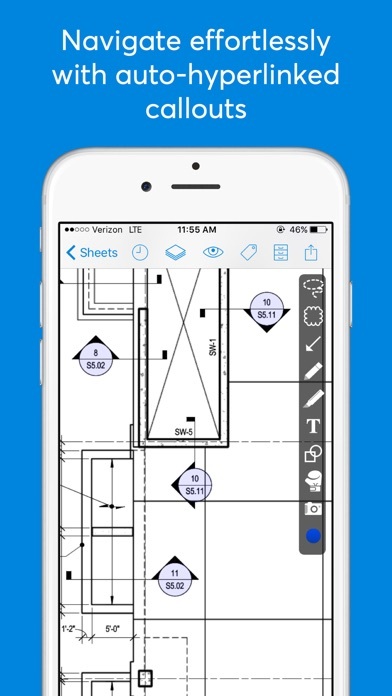 Far and away the best construction based productivity app on the market!! I like it, and I’m not ashamed. PlanGrid has moved from something I casually asked if we would be using on a project to the standard- every project I am on is now on PlanGrid. Passing information between the field and the office has never been easier; fumbling around with full size prints is a thing of the past. Is this app perfect? Not quite. Is it light years ahead of where we were even 2 years ago? Yes. Yes it is. If I could give a 4.5 star review I would, but all of my suggestions so far have at least gotten a response, many have been implemented. Thanks PlanGrid! These designers are clearly top notch!! I've used other apps but none that work this well in the field and that was actually adopted by my field folks. Keep it up PlanGrid! App opens fine, but when you try and open a project it crashes on iPad. Works fine on iPhone7. Fixed with Jan 15 update, but now I get to go through re downloading all projects. Poor review from this user. After the update, when I try to open a project on the iPad, the app crashes. I deleted the app and reloaded it but the problem persists. This program makes job coordination and documentation a breeze!!! Really easy to learn, especially for my guys in the field. Newer updates such as notification alerts have really helped our team stay on top of it. Definitely one of our top tools on the job site. 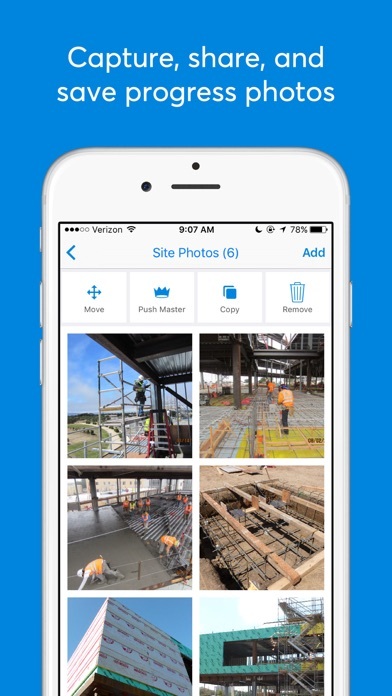 Upgrade to new PlanGrid and it *deletes* your local files without warning! Really.!?! Yes, not a crisis if your site has network wifi, but if it's locked down, or your network is a one-hour drive away, you'll think of many neat things to say about this. Time lost? ALL day with no files. All that day with NO files. EVERYONE on site with PlanGrid... with NO files. So awesome. Not. Waiting for the next undocumented "feature" with bated breath. PlanGrid is in the top 5 apps I’ve ever used. I can’t imagine working without it.